I've gone back and forth over Gwyneth Paltrow. I found a pic of her in a light, bright orange in front of a gentle grey background, and I surrounded her in each color separately. To my eye, the orange orangifies her face, while the grey picks up the reflected light in her skin. That says Summer, not Spring, to me. It'a very hard to find a pic of Gwyneth without overbearing eye makeup. Light Summer should not have black around her eye. This pic is better than many, though. And it shows how much healthy color Light Summer's skin reveals when there's not a lot of competing color nearby. Delicate skin needs a delicate context. Put her in something loud and high-contrast, and that skin will become an unpretty expanse of uniform paleness - or an unpretty reflection of the too-strong color, as with the orange above. Light Summer Naomi Watts doesn't look her best here. Our eyes keep going to the black, black dress instead of to her face. When we focus on her face, the too-warm makeup is distractingly orange. Overall, she just looks tired and flat. Much better. The color on her face is pinker and brighter, but not heavy. Naomi is lovely here. Cate Blanchett almost always gets it right. I'd bet money that she has a Light Summer swatchbook. Her colors are rarely too dark or too warm. More impressively, she doesn't make the mistake of going 100% cool, all the way into the soul of Summer. Google images of her, and you'll see how she manages to perfectly balance light, cool colors with the hint of radiant warmth that Light Summer requires. Her light golden hair usually provides the warm counterpoint to an otherwise cool ensemble. 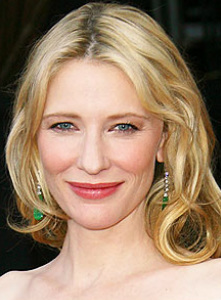 It took some searching, but I did manage to find a few pics of Cate that don't show her at her best. The look at the top seems more Deep Autumn (except for that lip! ); it washes Cate out. The middle is cool but too muted; it makes her seem older. The bottom pic just looks like she's forcing the warmth; with hair, cheeks and lips all artificially reddish-orange, it's as if the woman herself has disappeared.